FF&E with architectural desigm, learning technology and pedagogy all go hand in hand - you can't proceed on these one at a time (as schools found when they only looked at ICT, or just built new classrooms). New pedagogies and new technologies have inspired a fresh look at furniture and fittings. In 3rd millenium spaces - typically larger, multifactedted and with bigger groups, or more groups, in them, there remains the need to get groups of children together to convey something importwent, or for a moment of shared celebration, for presentations and just because sometimes it's nice to do so (sense of "us-ness", collegiality, mutuality etc). Just shouting out across a large space won't do, of course, so sittying them together in a compact way is a need. 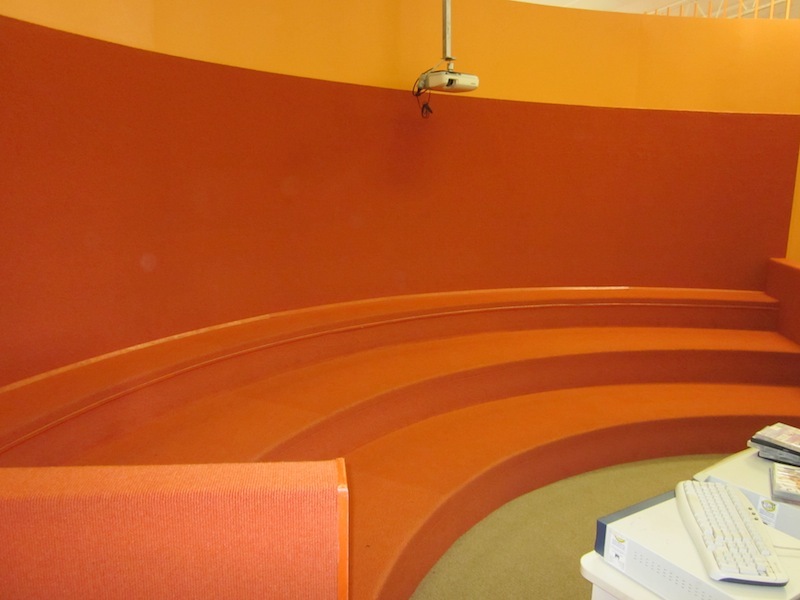 With the youngest of pupils this may just be a "cosy carpet", but for larger children schools have been constructing a range of "tiered seating", and some is even available commercially. The design cue has come from science labs where often, if a really important point is to be conveyed (perhaps a saftey issue), the whole grouo will come up to the front with their lab stools (if it's that kind of lab) and sit close in front of the teacher - or presenter - in a tight intimate group. Voices are not raised, eye contact is everything. But it is even better when, as below, the seating is purpose built and height is added into the design equation. Here are some examples - commented - and there are some further overall remarks below the examples. this example (above) from a primary school in Australia is substantial and structural. 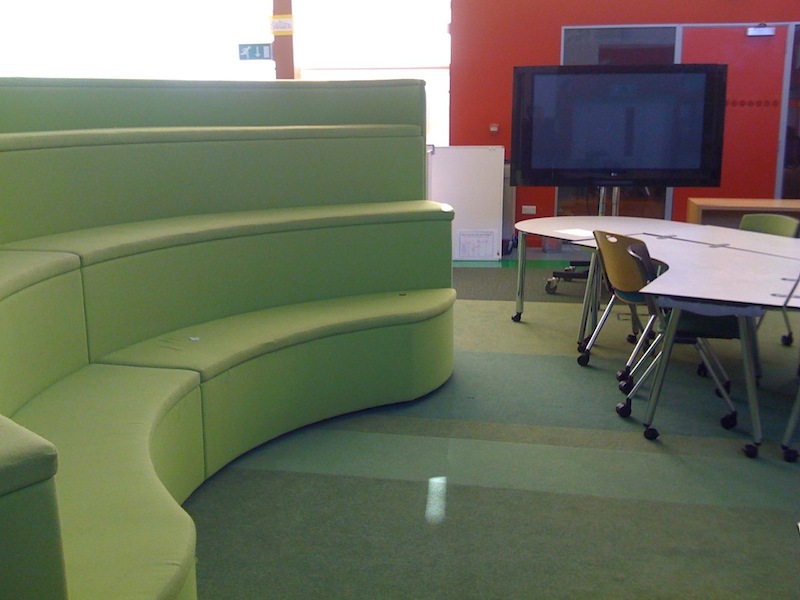 This example (above) from a Kent school is moveable - in my view this is the best design, students are closely spaced, sitting between each others legs - rather than in front of - and with good height so that a full class can be located here. The only design change would be perhaps to make storage available "round the back" to loose bags etc and de-clutter the classroom. new Line Academy who built these for their "learning plazas" also have a shoes-off rule for these areas which is also very effective (see here for why). Below you can see them "in action". and these (below) from Lampton School's classroom of tomorrow are purchased from Isis furniture. You can see that new technologies like tablets are particularly suited to this type of seating. 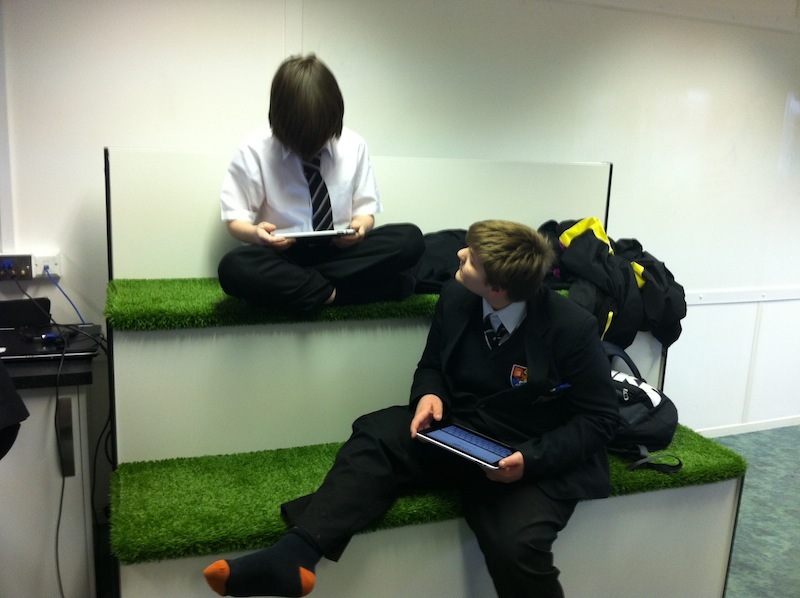 Interestingly tablet comuters like these iPads seem to lead to better collaboration and more sharing that the old laptops - the tiered seating also works well for children "overlooking" each others' work. in Norway the Kaleido team are building ICT Centres to help generate a step change in teaching and learning across the nation - I am honoured to have some involvement in this. 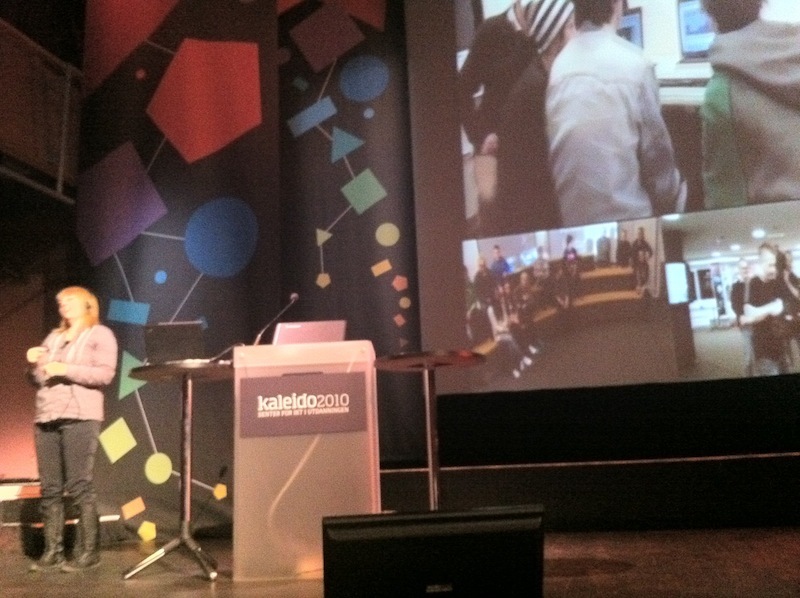 As you can see (below) from this image - a real time webcast from the first of the ICT centres at Kaleido's oepning event in Tromsø - the tiered seating is working well for them too. 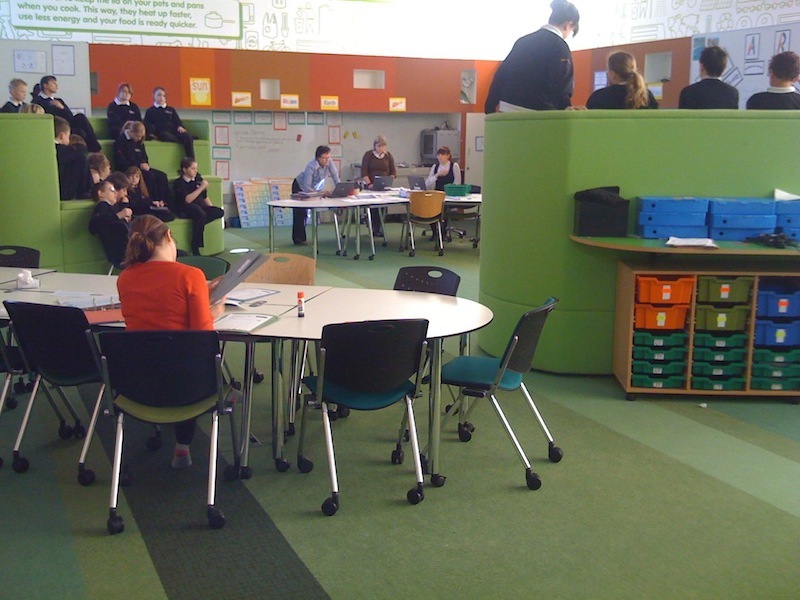 most of these tiered seats are specified by schools and built locally - even as a tech / design project within the school. Built light enough and with handholds cut in, it is simple to lift and move them - i think wheels are just one more thing to fail!